For the NES game, see Castlevania II: Simon's Quest. 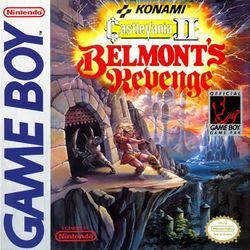 Castlevania II: Belmont's Revenge (ドラキュラ伝説II, Dorakula Densetsu II?, lit. Dracula Legend 2) was the second Castlevania game released for the Game Boy and a direct sequel to Castlevania: The Adventure. Once again starring Christopher Belmont, this time on a quest to rescue his son, Soleiyu Belmont, from Dracula. The game was originally released of the Game Boy (in black and white) in 1991 in Japan and North America. It was re-released for the Super GB in 1998 in Japan as part of Konami GB Collection Vol. 3. It was re-released for the Game Boy Color in 2000 in Europe as part of Konami GB Collection Vol. 4. This page was last edited on 15 October 2018, at 08:33.